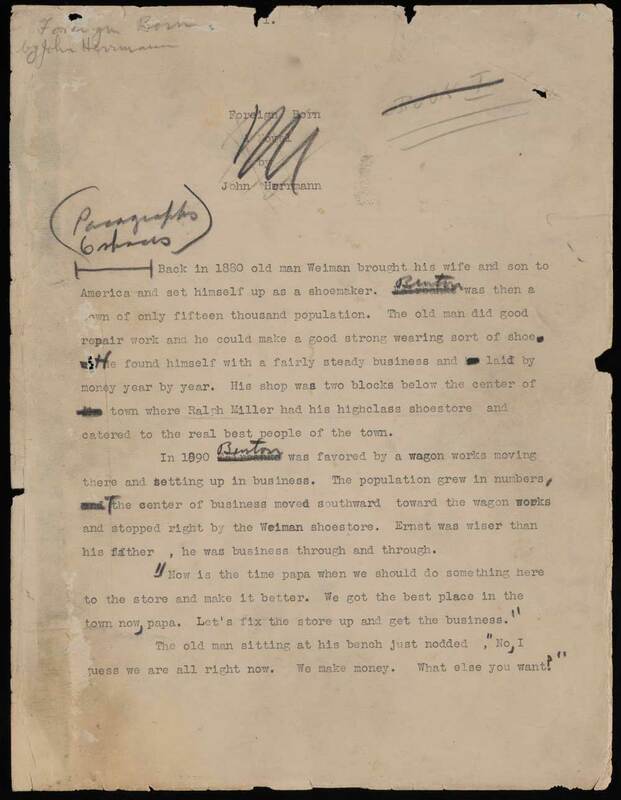 While doing research in the John Herrmann collection during her fellowship at the Ransom Center, Sara Kosiba found a manuscript of an unpublished 1925 novel. Titled Foreign Born, it tells the story of Ernst Weiman, a German immigrant living in the fictional town of Fairbanks, Michigan during World War I. Previously a well-respected member of the community, Weiman soon comes under suspicion by his neighbors for his pro-German views during World War I. Herrmann’s novel is a close look at war-time anxieties, prejudice, and the question of what it means to be American. Foreign Born was published in 2018 by Hastings College Press, based on the manuscript in the Center’s Herrmann collection. It includes an introduction by Kosiba. Tell us about the moment that you discovered the manuscript of Foreign Born. Had you heard of it before? Did you know at the time that you had uncovered an entire novel? Sara Kosiba: John Herrmann scholarship is almost non-existent. There is no comprehensive published bibliography or even biography (I’m actually slowly writing what will be the first biography). 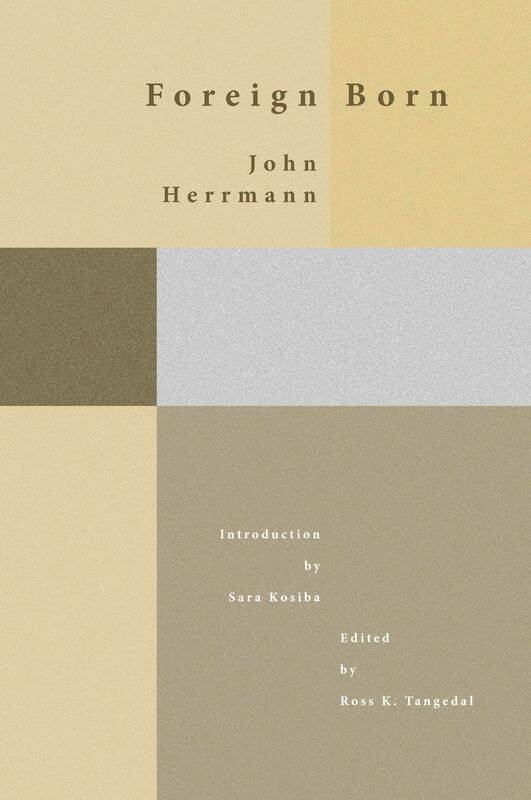 When there is a reference to Herrmann, it is mainly in connection with his friendship with more famous writers like Ernest Hemingway, John Dos Passos, or William Carlos Williams or in connection with his Communist politics in the 1930s. Prior to my fellowship at the Ransom Center, I saw a passing reference or two to something with that title in a few of Herrmann’s letters, but nothing that gave me any substantive idea of what the text was about. I knew it was a longer work from the Ransom Center finding aid, but I had no idea that it was actually a complete novel. At the time of my fellowship, I only had time to photograph the pages, but when I delved back into the photographs of the manuscript later, I realized that there was a whole additional novel by Herrmann that scholars had never discussed. 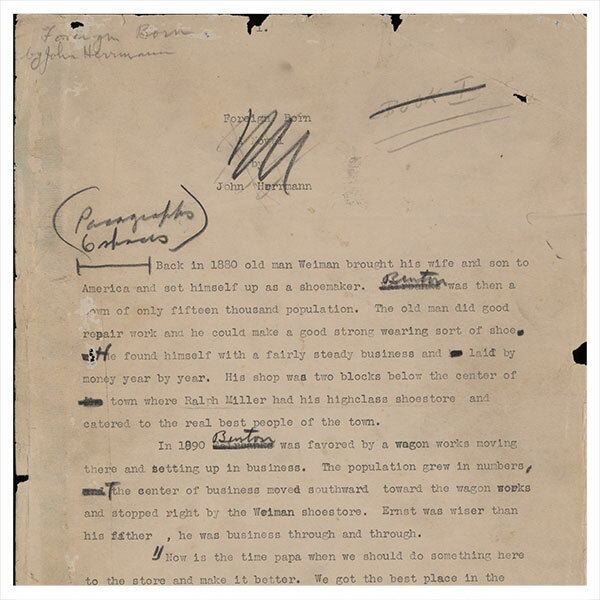 John Herrmann, Signed typescript of “Foreign Born” with handwritten revisions and corrections, ca. 1920s. John Herrmann Collection, Harry Ransom Center. Are there themes in Foreign Born that are familiar to you as a scholar of midwestern literature, or does this novel tell us something new about midwestern culture and literary history? The book is notable for being the only novel to give a full length treatment to the harassment of German Americans during World War I in the United States. Other authors of the time address the backlash against the German American community in other ways, such as short references in Sinclair Lewis’s Main Street or Willa Cather’s One of Ours, but Herrmann’s novel fully delves into the life of a German American in a small city in Michigan and draws on real life events to critique the often hypocritical way the community behaved. Initially, Ernst Weiman, the main character, is loved by the local townspeople. As the United States becomes involved in World War I, he is increasingly ostracized by the community for his German heritage and pro-German views—views that are not anti-American as much as simply show a man in conflict between his new American home and his German heritage. As much as Ernst’s views may be worthy of critique, the book is fascinating in its analysis of the shallow patriotism shown by the “100 percent Americans” around him. Herrmann drew on real world examples from Lansing, Michigan, his hometown, in writing the novel, which makes it not only a significant literary contribution but a book that also contributes to analyzing and discussing American history. What do you think the relevance of Foreign Born is today? And how do you think it will influence the way in which we remember and study John Herrmann? A few novels address the anti-German climate in the United States during World War I in passing ways, but Herrmann’s novel is the only full length treatment I’ve found. I do think it will influence Herrmann’s reputation as a writer as people discover the novel. He isn’t very well known, and critics haven’t been wrong that his writing is uneven at times. Foreign Born is his second novel, written less than a year after his first novel, What Happens, when he was at his most innovative and creative point. It shows him as a writer capable of delving into interesting and complicated topics and themes. Why do you think Herrmann was unable find a publisher for the book? Herrmann was circulating the book in 1925–1926, and I think a lot of people wanted to conveniently forget the way German Americans were treated during the war. Several publishers noted that there were interesting aspects to the novel, but they didn’t feel there was a profitable gain in publishing it. How did you pursue getting Foreign Born published? I didn’t turn to the manuscript right away after the discovery, as I was more concerned with getting his first novel, What Happens, republished. That novel has a fascinating story of its own and was actually a major motivation in pursuing the Ransom Center fellowship. Once What Happens was out, I read over Foreign Born and knew the topic would be of interest to people. I started querying a few regional publishers to see if they had any interest. It was turned down repeatedly for a very similar reason to the rejections that Herrmann was getting in the 1920s—there was no profit in it. 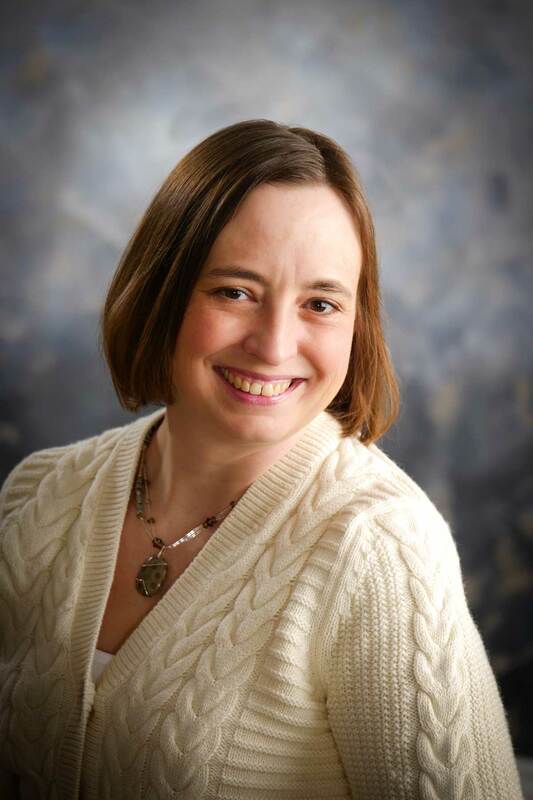 I’ve been very fortunate to know Patricia Oman, director of Hastings College Press, a student project based press that has been working to get older or neglected regional texts back into print. They took a chance on publishing What Happens, and the response to that was fantastic, and they were ultimately generous enough to give Foreign Born a similar opportunity. From your own biographical research on Herrmann, how much of Foreign Born do you think was based upon events and behavior that Herrmann actually witnessed? Herrmann was born in 1900, so he was in high school during the war. I have no evidence that he directly witnessed the events he writes about, as I have seen few personal documents from that time in his life. Based on archival newspaper research, he likely had heard news of almost everything first hand. Many of the incidents in the novel can be found in the pages of the Lansing, Michigan, newspapers of the time. So I would find it surprising if his family, with its German ancestry, didn’t know what was going on—although there is no evidence that Herrmann’s family directly experienced the same bias and harassment he writes about. For example, a local butcher in the novel is tarred and feathered in Foreign Born for his pro-German views, and there is substantial coverage of the real world parallel to that incident in Michigan newspapers of the time. In fact, there’s suggestion, both in the novel and in existing evidence, that the Lansing State Journal knew of the incident before it occurred. It suggests that someone at the paper was either tipped off to the event or may have even participated in it. What do you think is the importance of archival research in the humanities? How has it contributed to your own work? Archival research in the humanities is vitally important. If places like the Ransom Center didn’t make efforts to preserve the papers of lesser known writers like John Herrmann, we would never know about his life and work and how it contributes to our understanding of American literature. While he may be a minor figure in literary history, his story contributes to a broader understanding of the literary and historical landscape of the twentieth century. Archives help us to discover all the components of that larger story. Sara Kosiba is former associate professor of English at Troy University and currently an independent scholar. She was the recipient of a Harry Ransom Center research fellowship supported by the Andrew W. Mellon Research Fellowship Foundation.